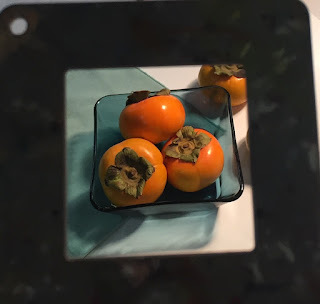 Shiny Persimmons - and Happy Thanksgiving! Happy Thanksgiving! 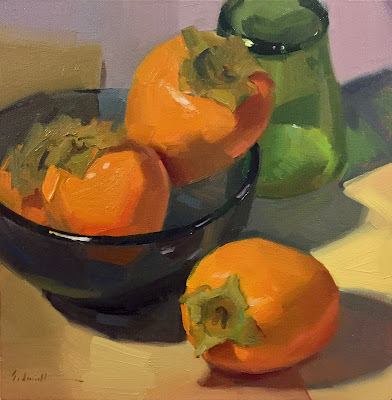 I'm grateful for green and orange, just one of the many color combinations that make my heart sing. I'm grateful for you, the artists and art-lovers that inspire me to create. And I'm grateful for the process, for learning and growth. 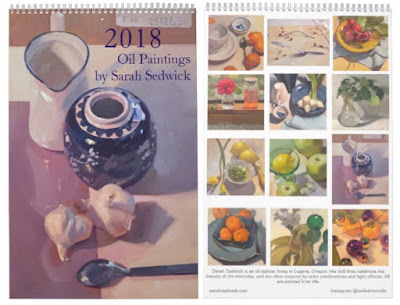 Looking forward to more and more - this holiday season and onward! My first ornament painting of the year! With this shiny gold ribbon thrown in as a bonus. 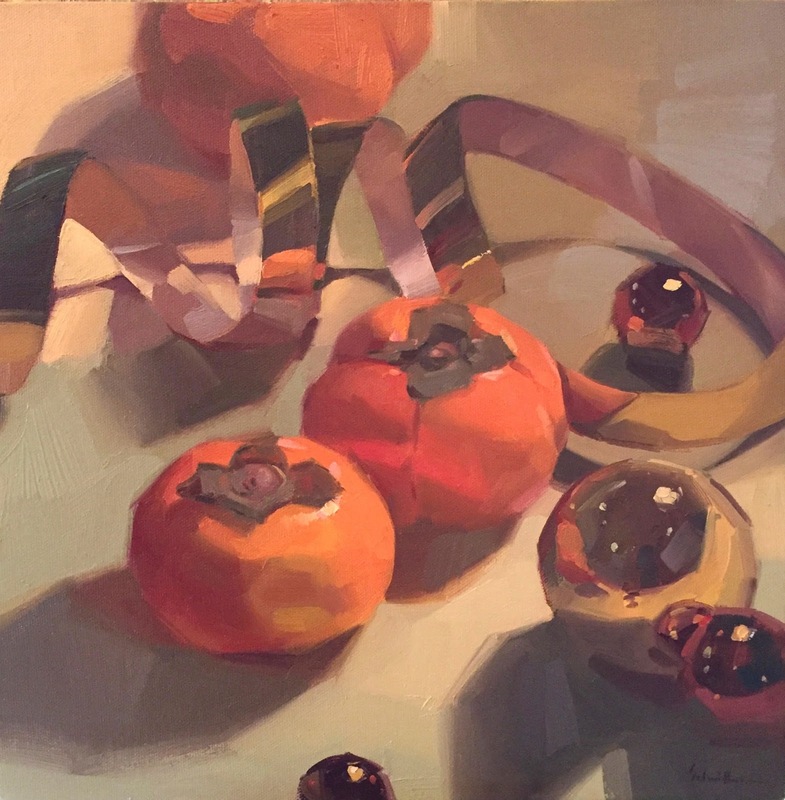 I love the texture and movement that ribbon brings to a still life - and the eye workout! 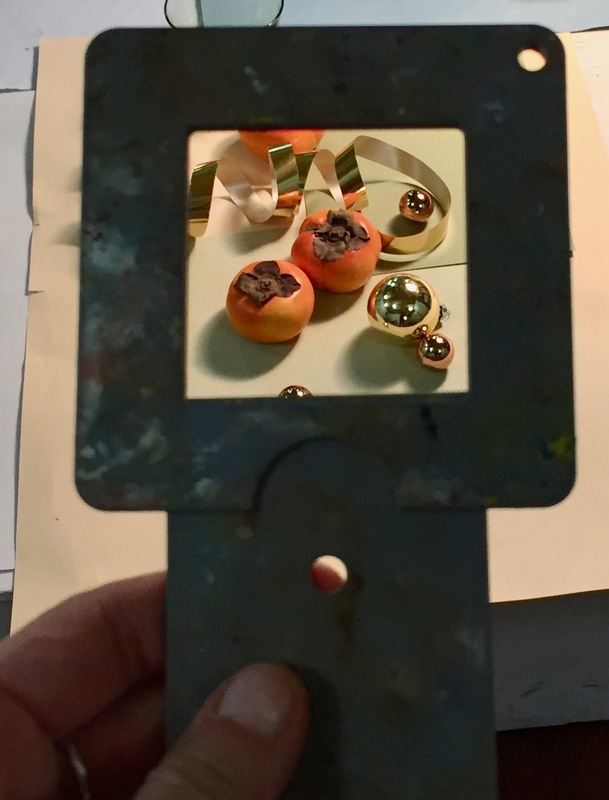 Here's how my paintings begin - as compositions seen through a viewfinder. 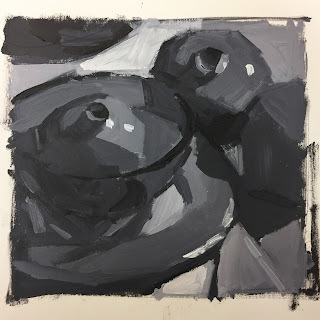 Looking through an aperture that's the same format (square, rectagle - horizontal or vertical) as my canvas helps me decide where to place the objects in a painting. 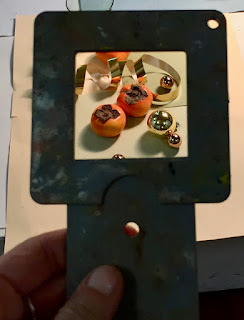 Using this tool takes SO much of the guesswork out of my process, but taking photos through a viewfinder? Definitely a next-level challenge. I'm working on it! I only made it to one plein air paintout this year, but it was great, and a new one for me - located in Roseburg, Oregon, a smallish town about 60 miles south of Eugene. On the first day, we painted cityscapes, which I have a much easier time with than traditional landscapes, for several reasons. After some trial and error, I settled on this corner scene - the strong shadows, the truck, the "stop-go" interplay of that red hand and the green cross.... all attracted me. 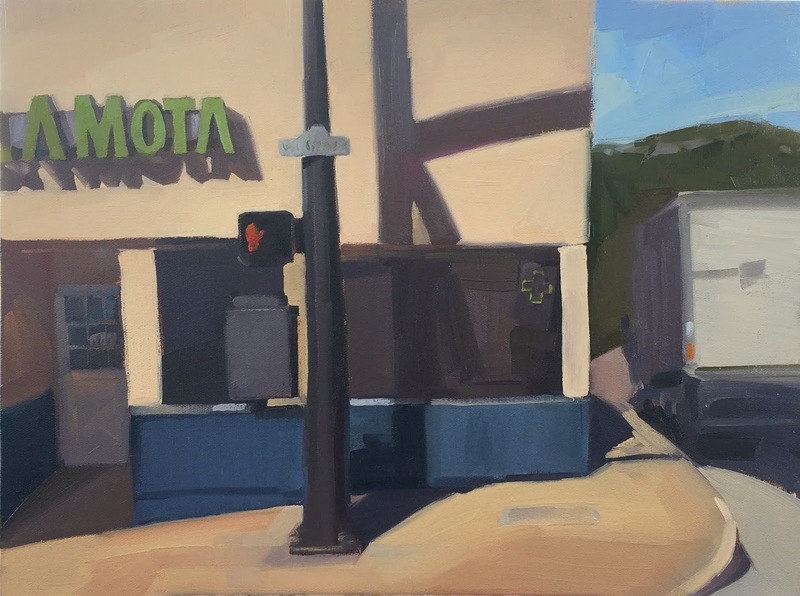 La Mota means marijuana in Spanish, and yes, this is a painting of a recreational pot store. We have these - lots and lots of them - in Oregon now. It was an interesting spot to hang out in front of for an afternoon - at times I felt like I was conducting the most un-surreptitious surveillance operation ever. But no paranoia required, folks! I'm just arting over here. 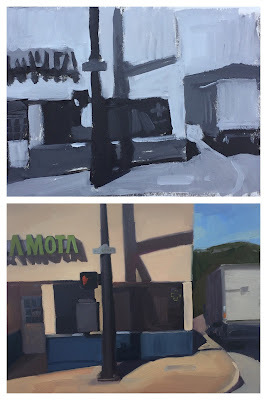 The three paintings I ended up submitting for judging. 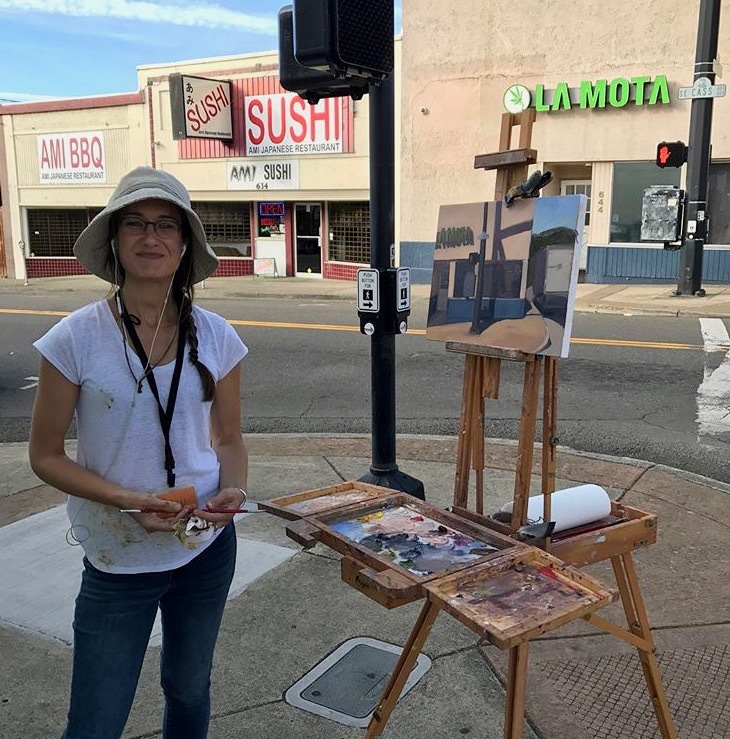 I don't participate in these events to win - in fact, I consider myself a rank amateur when it comes to plein air. But I enjoy it, I always learn a lot! ...And here's a bonus for reading this far! I've got a major sale going on in my Etsy shop for the next few weeks. 50% off everything - including "La Mota." Use the code HOLIDAYHALFOFF. 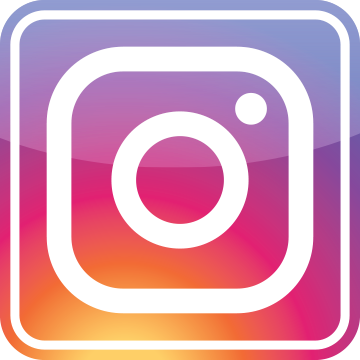 And thanks for following my work! 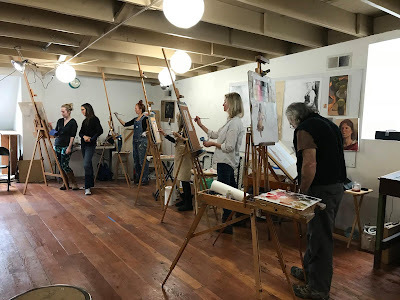 I taught "Beginning Figure Painting" on my home turf this past weekend, at Whiteaker Printmakers in Eugene. 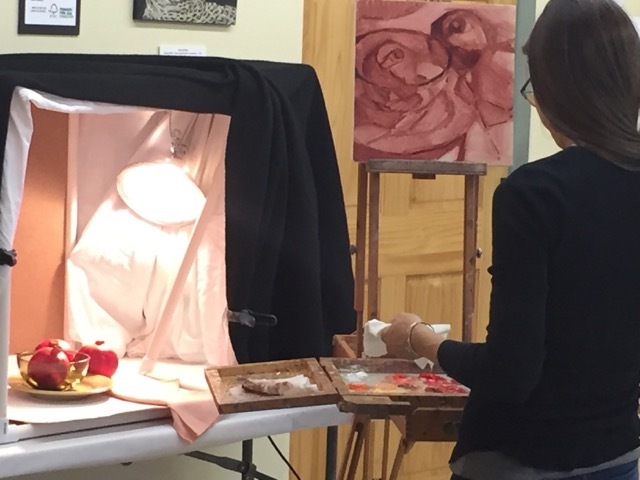 It was an enthusiastic, talented group, and I thoroughly enjoyed painting with them! We started out with gesture drawings, mixed flesh tones using the Zorn palette, and they painted these lovely pieces - all in two days! 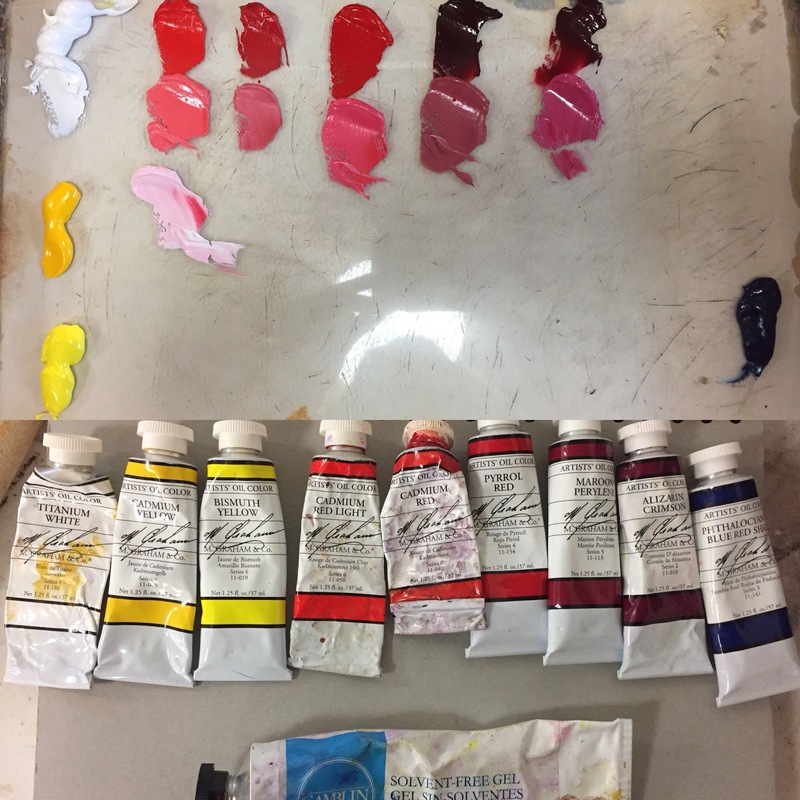 Here's my color chart, and two little demos - same pose, different lighting, four values. 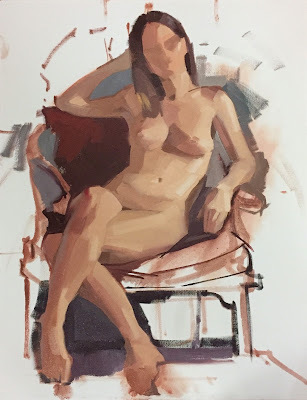 If you're interested in trying this limited palette technique, I've got two portrait workshops coming up - one this weekend, November 11-12 at Sequioa Gallery + Studios in the Portland, OR area (spaces are still available), and the other in Eugene, at Oregon Art Supply, January 6-7. Live models, and lots of painting! Click the links for details. "Admirers," And New Paint Colors! 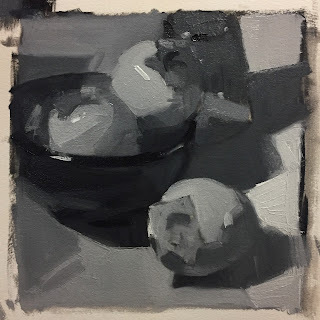 I did a quick black-and-white oil study before launching into this one, right in my sketchbook, to plan out my composition and value structure. 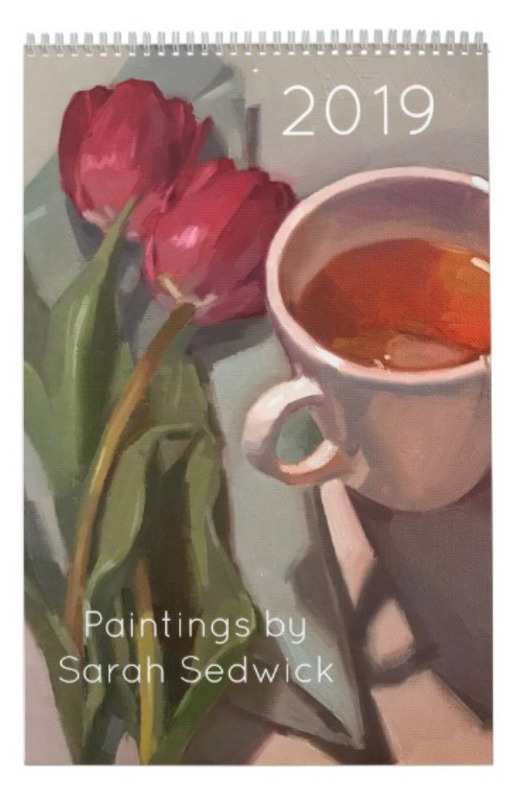 I painted this during a demonstration of M. Graham's new paint colors at my local art supply store. 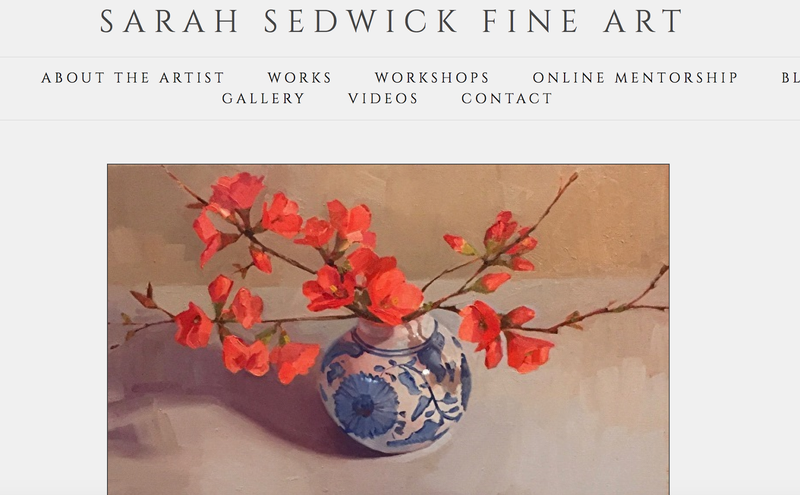 M. Graham just expanded their line of fantastic oil paints from 50 to 75 tubes, big news! Some of my new favorites are Bismuth yellow, Pyrrol red, and Pthalo blue red shade, all of which I used in this piece. 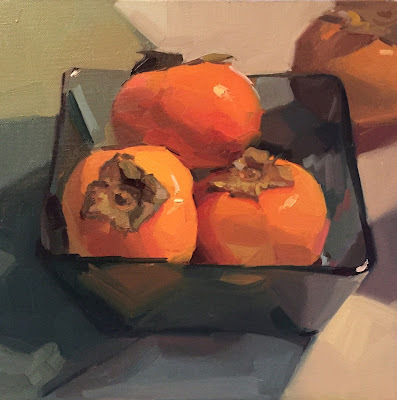 I love having an audience when I paint - whether it's my online students joining me virtually, a group of workshop students, or friends who come out for a demo, the back-and-forth is always enjoyable. If anything, chattering away while painting seems to help my focus and concentration, go figure! I'm looking forward to demoing again, November 8-9, at the Tools of the Trade Show at the U of O. Come say Hi and pick my brain about M. Graham's new colors. I love em! 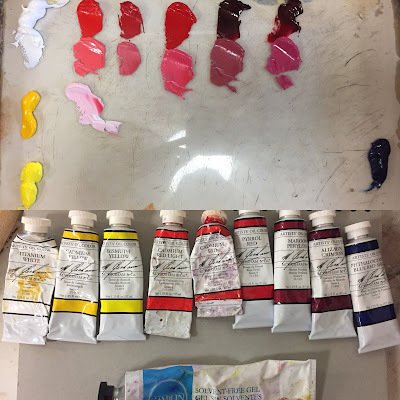 And the palette I painted it with! Lots of reds in the mix, along with two yellows - a warm and a cool - and one big strong blue. In other news, my 2018 calendar is out! Order yours by clicking here - or come visit me November 8-9 at the Tools of the Trade Show at the U of O Duck Store. I'll have a few to sell, and some new greeting cards too! 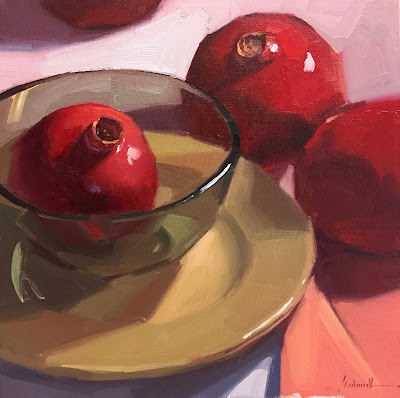 My next still life workshop will be November 18-19th, at Oregon Art Supply in Eugene. Two days of Painting the Dynamic Still Life! Hope you can join me.